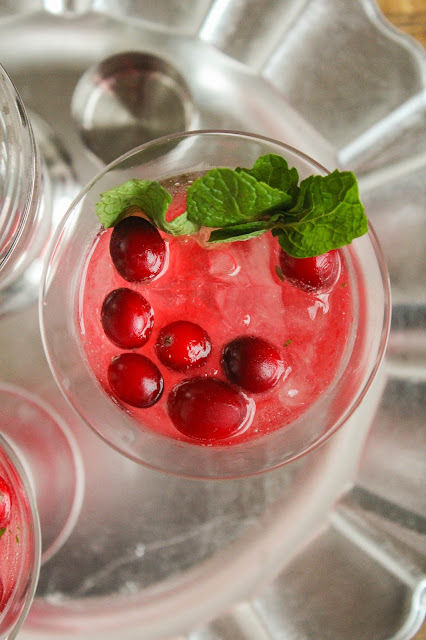 Impress your holiday guests with this light, refreshing and delicious Cranberry Mojito cocktail! I love a good cocktail, especially during the holidays. I'm not one who really drinks that much, but it's nice to have a drink or two during parties or celebrations. 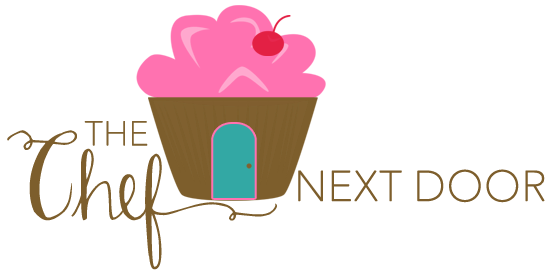 This holiday season I wanted to create something light and refreshing, but still full of flavor. 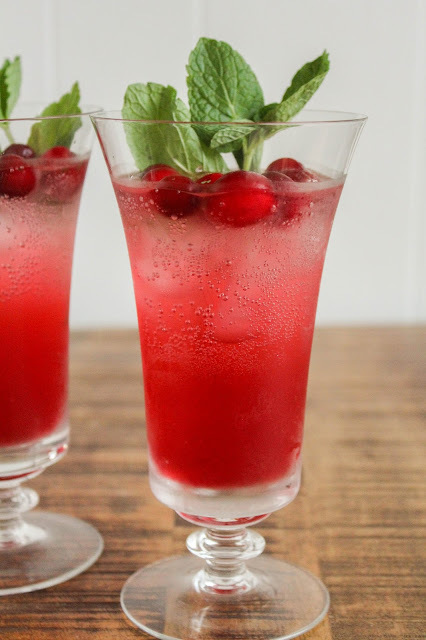 This Cranberry Mojito turned out to be exactly what I was looking for! 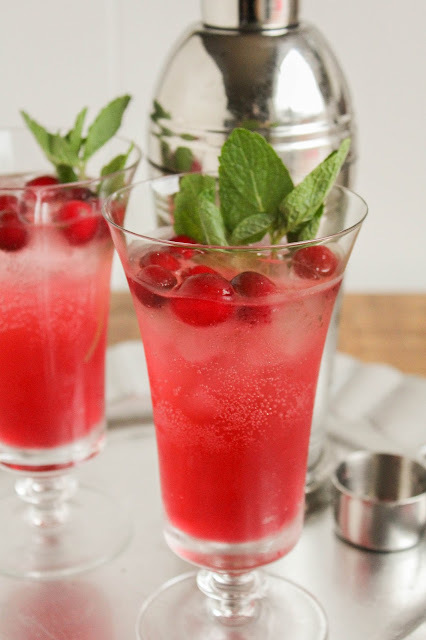 Made with light cranberry juice and DASANI sparkling water, this mojito is low in calories and sugar. DASANI sparkling water is the perfect mixer because it has ZERO calories, no added colors, is caffeine-free, and naturally flavored. It adds the perfect amount of flavor and bubbles to this cocktail! Add fresh mint, lime juice and whole cranberries and it not only looks festive, but tastes festive too. 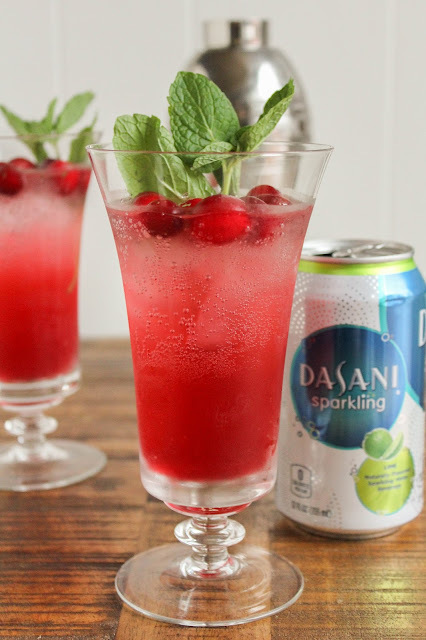 DASANI Sparkling water comes in four delicious flavors - Lime, Berry, Lemon, and Black Cherry - and is available in a 12 pack of 12 oz cans. I've been sipping on the Black Cherry lately, which is equally as delicious as the Lime! I found all the flavors of the sparkling water at my local Walmart. Now who's ready for a cocktail? In a cocktail shaker, muddle the mint leaves. Add the cranberry juice, rum, lime juice, and a handful of ice cubes. Cover with the lid and shake vigorously until chilled. Strain into two cocktail glasses filled with ice cubes. Top the drink off with the DASANI Sparkling Lime Water. Garnish with a few fresh whole cranberries and a mint sprig. Check out the Easy Party Drink Recipes Pinterest Board for the best cocktail and mocktail ideas for any festive celebration! Mandatory Alcohol disclaimer: You must be 21 to consume alcoholic beverages. When doing so, please drink responsibly. No drinking and driving, and no drinking and texting!